Looking For Old Saabs On The Street? Head To Eugene! I've come up woefully short in the Saab department in DOTS, with the oldest Born From Jet car I can find in Alameda being a 30-year-old 99. 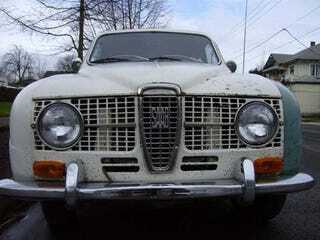 Fortunately, we have Oregonian PaulN doing his part to remedy the Saab Shortage, and he's caught this rough-but-proud '68 parked on the street in Eugene. Be sure to make the jump for more photos, but not before you read some of PaulN's Auto-biography series on TTAC!